Well…..My Gran’s love of wildlife and mother’s love of food are probably to blame. I felt a strong connection with outdoors from a very young age. Going on holidays to Scotland, watching otters, seals and eagles with my family and enjoying the wilderness and wildflowers was the start of it all. But I didn’t realise horticulture was an actual career until I was nearly 20. Growing fruit and vegetables was my first passion and from there a general obsession and love of plants and gardens. I have had a wide range of gardening jobs in the last 10 years, some of which have a huge impact on my gardening philosophy. 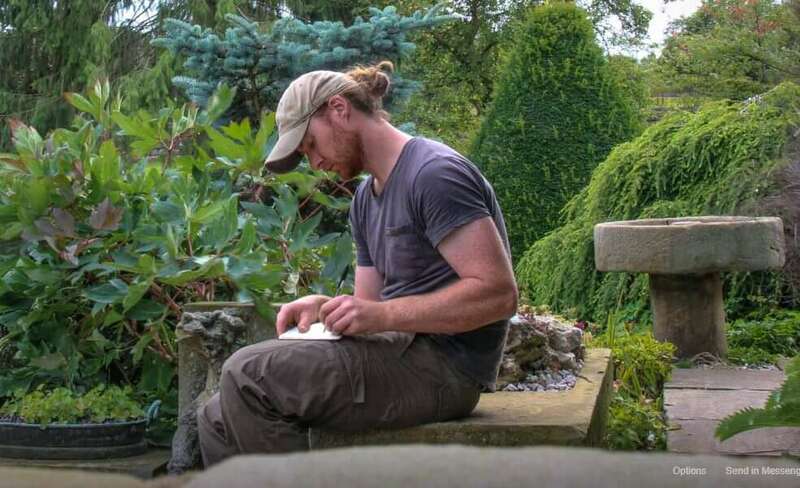 After studying a degree in Horticulture and Plant Science at University, I undertook an internship with the Historic and Botanic Garden Bursary Scheme, at Audley End House and Gardens in Essex. A magical year working in a team of 13 gardeners and over 50 volunteers, lead by Alan North my now good friend and gardening mentor. I gained a vast amount of knowledge about gardening, the most important thing being that it’s people that make a garden not just the plants. I’ve also had a few short working stints and holidays at Great Dixter, absorbing the brilliance of the late Christopher Lloyd and Fergus Garrett. Most recently I was head gardener at Goldsborough Hall and a small private garden in North Yorkshire. There are many gardening styles that I’m interested in but the one that I get most excited about is high maintenance succession gardening. It’s hard work but great fun. Playing with perennials and annuals in amongst interesting shrubs to create a garden that looks amazing from the first snowdrop until the first frost. Wow! What a garden, I joined at a great point in the season. The salvias and dahlias were flowering their socks off, the white garden was looking stunning, the runner beans were growing quicker than we could pick them and I’ve been learning more names of volunteers than my first day at school. It’s a lot to take in but I’ve loved every minute, long may it continue. Ruth and Barbara have also made me feel very welcome, I feel privileged to be part of the team. Seeing the garden through the seasons will be the first thing, that’s the great thing about gardening, there is something to look forward to in every season. We are also entering a new era at York Gate and can’t wait to be part of all the new developments both next door, and in the meadows at the foot of the garden.